With (you guessed it) a deck facing directly over the river and into the CBD, The Deck has arguably one of the best vantage points in the CBD. Choose from a 3 course meal early in the night, or join the party later with their all-inclusive canape and drink package. With a family friendly sitting at 5pm followed by a second at 8pm, and a huge menu to boot, Bluetrain has plenty of delicious options. The bar also features a massive 18 rotating beers on tap and an extensive cocktail list to keep the party going after dinner. Early birds, night owls and barflies rejoice! BearBrass have the perfect NYE celebration for you – choose from an early or late dinner sitting, or join the party in the BearBrass Bar. Diners will enjoy shared entrées, their choice of main and (for the late sitting) dessert! Send 2018 packing at P.J. O’Brien’s Madam Rouge Party, complete with live music, bubbles & canapes on arrival, and Lillet & Chambord drink specials. Looking for something a little quieter? PJ’s Sidebar are serving up early and late dinner packages, guaranteed to hit the spot and keep you satisfied ‘til 2019. 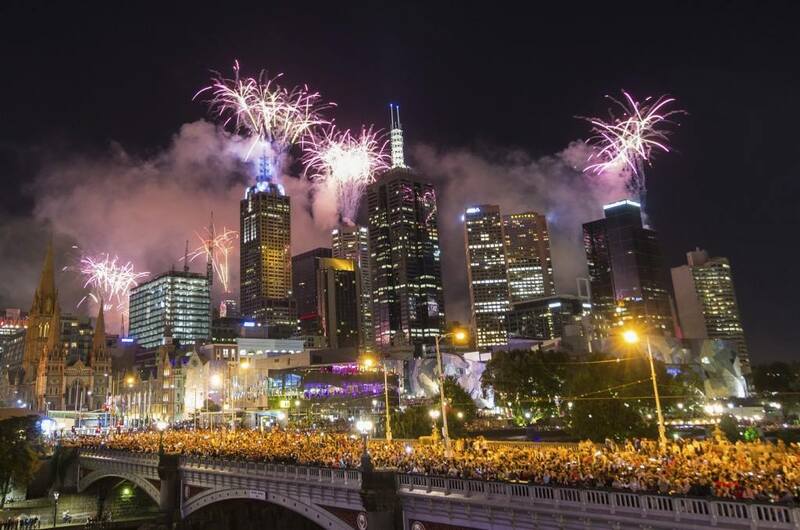 There are plenty of festivals happening over New Year’s Eve, but only one along Southbank – the Hophaus Biergarten NYE Festival! Whether you’re keen for a cocktail party or prefer a spot of sit-down dining, packages await. For a NYE that’s actual fire, Miyako is the place to be. Their talented Teppanyaki chefs will be firing up the grills and cooking everything from Eye Fillet to Lobster Tails for a meal that you won’t forget soon. If you’re looking to end 2018 on a high, consider Pure South Dining’s menu your fine dining ticket to the clouds. Cold smoked line-caught Kingfish with green tomato, jasmine and parsley. King Island grass fed Eye Fillet, Beef Cheek, kohlrabi, pearl onion, café de Paris. Anvers Chocolate ‘soft chocolate ganache’, Tasmanian cherries and coffee – need we go on? Pure South Dining’s downstairs sibling embraces a more casual approach to eating out, but don’t let that fool you – the quality and flavour of the food is everything you expect, with Executive Chef David Hall working his magic on a 4-course menu (with premium beverages included, of course). If you can’t be in Italy this holiday season, La Camera is the next best thing. Sit down to four courses of delicious Italian food – be sure to book a balcony table for the complete al fresco experience – and settle in for the firework show! Kicking off from 8:30pm, Tutto Bene’s NYE packages are something special. Imagine sitting down to four (that’s right, four) courses of amazing Italian dishes, with beverages included – plus, a glass of champagne for when the clock strikes midnight! If this doesn’t suit your timeline, don’t forget their a la carte menu is available from 5:30pm – 7:30pm. Million dollar views, for a fraction of the price? Waterslide Bar is your ticket. The party kicks off at 8pm, with 4 hours of wine, sparkling, beer and ciders, plus roaming canapes. If you’re looking to dance the night (or year) away, look no further!